David Haskell Professor of biology at The University of the South. Reprinted by arrangement with Viking, a member of Penguin Group (USA) Inc., from “The Forest Unseen” by David George Haskell. Copyright © 2012 by David George Haskell. MS. DIANE REHMThanks for joining us, I'm Diane Rehm. 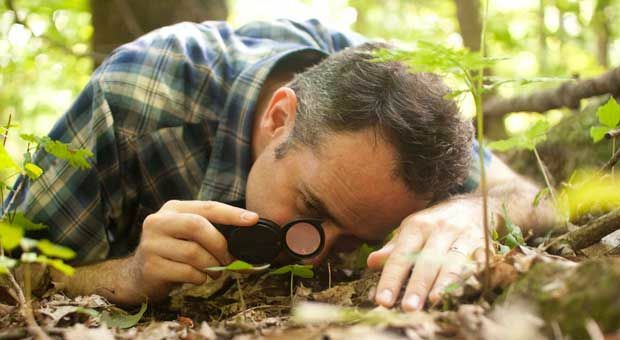 Every day for a year, biologist David Haskell returned to the same one square meter spot in the Tennessee forest. What he saw there gave him a new understanding of the intricate link between all living things. MS. DIANE REHMIn a new book titled "The Forest Unseen," Haskell gives us an intimate look at the inner workings of the forest. He explains how plants and animals survive the cold, why moths help clean the water supply and what causes sibling rivalry among bees. MS. DIANE REHMDavid Haskell joins me in the studio. We'll welcome your questions, comments. Join us by phone at 800-433-8850. Send us an email to drshow@wamu.org. Follow us on Facebook or Twitter. Good morning to you, sir, it's good to have you here. MR. DAVID HASKELLGood morning, it's a pleasure to be here. REHMThank you. I know you were thinking about doing this book for quite a while. How did you finally decide what you were going to concentrate on and how you were going to structure it? HASKELLI have wanted to write a book telling the stories and celebrating the stories of the creatures of the forest of North America for many years and I hadn't quite figured out the right way to do that. HASKELLAnd it came to me that I should. The best way to do that would be to draw together several strands from my own life, to use those in that storytelling enterprise. So I have a meditation practice that -- a daily practice of meditation sitting down and just being quiet twice a day and, of course, I'm a teacher of biology and scientist. HASKELLSo I thought what would happen if we combined these things and applied the contemplative approach to observing the natural world and of telling stories about the natural world? So I set out near my house onto a wooded mountain slope in Tennessee and wandered around haphazardly until I found a rock that looked like I could sit on it with a reasonable degree of comfort for a year. HASKELLAnd the area in front of that rock became my focal area for observation. The area was about one square meter, about the size of a small dining room table. And I returned to that over hundreds of hours through that year to just watch, be quiet, let go of the agenda of, you know, there's a lesson plan or a particular hypothesis that I'm testing and just try and open my senses to the world and see what would happen. HASKELLAnd then afterwards, I sort of ran off to the library and read all about the different things that I'd seen happening there. And often I knew a little bit, sort of the edge of many of those stories and I'd taught about them and written some about them in scientific journals, but I wanted to go deeper into the scientific literature and really hold up that unseen world of wonder that science is uncovering and make it available to people. REHMGive me an understanding of the word mandala, as you use it in this book. HASKELLThe guiding metaphor here is what I call the forest mandala, so the one square meter I call my mandala and I took that metaphor from Tibetan Buddhism. And the mandala in Tibetan Buddhism is a circle of sand about the same size as my one square meter in the forest, but the circle of sand is created by monks and it's an incredibly intricate sand painting, if you like. HASKELLThe creation of this mandala takes many days. It's an act of meditation. It's also an act of memory as many of the details are added from memory. But ultimately it's a representation of the entire universe and in the Buddhist tradition, that would be the path to enlightenment. HASKELLWhat I did was take that view, and I don't think any enlightenment was involved, but applied that same contemplative approach of narrowing down our gaze to a tiny, little window and thereby hoping to perhaps see more than we could by running around the whole continent just trying to see it all and do it all. And that's the contemplative gambit, narrow your gaze down to one breath, to one image, to one tiny, little patch of forest. HASKELLAnd then from that, perhaps you can, like a pinhole camera, you can see further into the universe and the focus of the universe becomes crisper for you. REHMWere you taking notes at the time? HASKELLYeah, but I did have a notebook with me. My tools at the mandala, I had a hand lens and some binoculars and a notepad and pencil. But mostly what I used, the notepad to draw insects or flowers so I could identify them later and so forth. I really didn't want the equipment, the writing equipment or cameras or microscopes and things, to be getting in the way. HASKELLI wanted this to be about the forest and my senses and where could we go by stripping some of the instrumentation, not that microscopes or instruments aren't amazing things, they are, but for this particular project, I wanted to set them aside. REHMWhat example can you give me of one day's observation? HASKELLExcellent question. So it's a difficult question because, you know, each day is so very different. The thing that really struck me, if I'm thinking about a particular example, is in the late fall, sitting in the forest and finally becoming aware of how the light spectrum changes through the day and through the seasons. HASKELLSo, of course, as the tree canopy drops to the ground and in the autumn, the intensity of light goes up. And we all know that and that's fairly obvious, but what I had not realized until I'd sat there for many, many hours is how the texture of the light, in which wavelengths are present, shift through the day, but also through the year. HASKELLAnd it turns out that the animals and plants in the forest mandala had learned this through natural selection many, many years before I became aware of it. REHMI'd like you to read for us from page five because I was utterly fascinated with this description. HASKELLI'd be happy to. So page five, I've been -- this is right at the beginning of the year. I've been sitting in the forest, that is, although it's January 1, we've had a little thaw and I'm watching the lichens and the parasitic worms and so all sorts of creatures right there on the first day. HASKELL"Union fusion, the mandala's inhabitants are plated into winning partnerships, but cooperation is not the only relationship in the forest. Piracy and exploitation are here also. A reminder of these more painful associations lies coiled on the leaflet at the center of the mandala, enclosed by the lichen-coated rocks. HASKELLThe reminder unwrapped itself slowly, held back by the torpidity of my powers of observation. My attention was first drawn by two amber ants bustling across the wet leaf litter. I watched their scurrying for half an hour before I noticed the ants' particular interest in a coiled strand nestled in the litter. HASKELLThe strand was about as long as my hand and was the same rain-soaked brown as the hickory leaf on which it lay. At first I dismissed the coil as an old vine tendril or leaf stem but as my eyes were about to move on to more stimulating things an ant paddled the tendril with her antennae and the coil straightened and lurched. HASKELLMy mind startled into recognition, a horsehair worm, a strange creature with a taste for exploitation. The worm's twisting gave away its identity. Horsehair worms are pressured from within and the tug of muscles against this inflated body make the worm jerk and writhe like no other animal. HASKELLThe worm has no need of complicated or graceful movement for at this stage of its life it has only two tasks left, to squirm toward a mate and then to lay eggs. Nor did the worm have need of sophisticated motion in its previous life stage where it lay balled inside the body of a cricket. HASKELLThe cricket did the worm's walking and feeding. The horsehair worm lived as an internal brigand, robbing then killing the cricket. The worm's lifecycle began when it hatched from an egg laid in a puddle or stream. The microscopic lava crawled over the streambed until it was eaten by a snail or a small insect. HASKELLOnce inside its new home, the lava unwrapped itself, wrapped itself, excuse me, in a protective coat, formed a cyst, then waited. The lives of most larvae are cut short at this point as cysts, never completing the rest of the lifecycle. The worm in the mandala was one of the few that made it to the next stage. Its host crawled on to land, died and was chewed on by an omnivorous cricket. HASKELLThis is such an improbable sequence of events that the horsehair worm's lifecycle requires parent worms to lay tens of millions of eggs. On average only one or two of this multitude of young will survive to adulthood. Once inside the cricket the spiny-headed larva-pirate bored through the gut wall and took up residence in the hold where it grew from a comma-sized larva to a worm the length of my hand, coiling upon itself to fit within the cricket. HASKELLWhen the worm could grow no more, it released chemicals that took over the cricket's brain. The chemicals turned the water-fearing cricket into a suicidal diver, seeking puddles or streams. As soon as the cricket hit water, the horsehair worm tensed its strong muscles, ripping through the cricket's body wall and twisted free, leaving the plundered vessel to sink and die." REHMDavid George Haskell, the book is titled "The Forest Unseen." REHMAnd welcome back. David George Haskell is with me. He's professor of biology at the University of the South. He was named the Carnegie Case Professor of the Year in Tennessee in 2009. His new book all about his experiences watching over a simple plot of ground within the forest for about a year is the subject of his new book. It's titled the forest unseen. You can join us. We're going to open the phones shortly, 800-433-8850. REHMHere's an email from Andrea who says, "I'm curious if and how your guest disguised or camouflaged himself during his observations to prevent his own presence from affecting the behavior of the plants, animals and the insects." What a good question. HASKELLThat is a fabulous question. Thank you, Andrea. I did not dress myself in a lot of camouflaged gear. In fact I don't own any pieces of camouflaged clothing in my wardrobe. However, I do make a habit of not wearing bright clothes out in the woods. And the main practice was to sit and to be still. That is the magic door into the forest is stillness. And people have known this for thousands, probably millions of years, hunters and nature observers and bird watchers and photographers. HASKELLAnimals get alarmed by our noisiness, by big sighs, by a motion. And so by being still we can settle down and connect in a little bit to the way the forest is when we're not present. However, dissociated observation is not possible in the woods. And I think that's also sort of a deep philosophical statement. And the physicists, they're also telling us that dissociated observation of the universe is not possible. We're all sort of all wrapped up in this together, the old notion of a purely objective observer doesn't hold any water anymore I don't think. HASKELLSo certainly animals -- some animals would be more hesitant to come to the square meter with my presence there. Other's seem not to -- it seemed not to really bother them. I had a number of, you know, birds which sat on my food. A deer nearly trampled me over. The raccoons came by. And so really being still and just hunkering down in my little brown jacket seemed to settle things down quite a bit. REHMAt one point you decided that you would even take it a step farther and be unto nature as nature was unto you. And that was totally naked. Would you read for us that portion? HASKELLYeah, so it's the coldest day in January and so here we go. "I'm taking my clothes off on the air. January 21 of the experiment. A polar wind rips across the mandala streaming through my scarf, pushing an ache into my jaw. Not counting the wind chill it is 20 degrees below freezing. In these southern forests such cold is unusual. Typical southern winters cycle between thaws and mild freezes with deep chills arriving for a few days each year. Today's cold will take the mandala's life to its physiological limits. HASKELLI want to experience the cold as the forest animals do without the protection of clothes. On a whim I throw my gloves and hat onto the frozen ground. The scarf follows. Quickly, I strip off my insulated overalls, shirt, T-shirt and trousers. The first few seconds of the experiment are surprisingly refreshing, a pleasant coolness after the stuffy clothes. Than the wind blasts away the illusion and my head is fogged with pain. The heat streaming out of my body scorches my skin. HASKELLA chorus of Carolina chickadees provides the accompaniment to this absurd strip tease. The birds dance through the trees like sparks from a fire careening through twigs. They rest no more than a second on any surface than shoot away. The contrast on this cold day between the chickadees liveliness and my physiological incompetence seems to defy nature's rules. Small animals should be less able to cope with the cold than their larger cousins. HASKELLThe volume of all objects, including animal bodies, increases by the cube of the object's length. The amount of heat that an animal can generate is proportional to the volume of its body. So heat generation also increases with the cube of body length. But the surface area where heat is lost increases by only the square of length. Small animals cool rapidly because they have proportionally much more body surface than body volume. HASKELLThe relationship between the size of animals and the rate of heat loss has produced geographic trends in body sizes. When an animal species exists over a large area the individuals in the north are usually larger than those in the south. This is known as Bergmann's rule after the 19th century anatomist who first described the relationship. Carolina Chickadees in Tennessee live toward the northern end of the species range and they are 10 to 20 percent larger than individuals from the southern limit of the range in Florida. HASKELLTennessee birds have tipped the balance between surface area and body volume to match the colder winters here. Farther north, Carolina Chickadees are replaced by a closely related species, the Black Cat Chickadee, which is 10 percent larger again. Bergmann's rule seems remote as I stand naked in the forest." REHMHow long did you actually stand naked in the forest? HASKELLIt took just a few minutes and my body was shaking. And the thing that really drove me to put the clothes back on, other than the sense of embarrassment, was that there was something coming from my subconscious mind that was deeply alarmed. I was dropping into the edges of hypothermia. HASKELLMy fingers weren't working and so forth. And this is just two or three minutes and yet these birds live here all winter. And Tennessee is pretty woosie when it comes to winter. I mean, we've got similar birds up in Canada and some even in the Arctic in the middle of winter where the sun never rises. It's freezing cold. How do they do it? REHMInteresting. I have on one occasion visited the University of the South. So I know it's beauty and I know it's surroundings. But how far from the university was the forest in which you created your mandala? HASKELLSo the university is a small liberal arts college in a small little town. And yet the university owns 13,000 acres of forest. And so I was actually on campus still. So from my office in my house, which is very close to my office, it was, you know, five minutes on a bicycle and then 15 minutes down the trail. So quite close into a small town and a small campus. And yet this mountain slope, as far as we know, at least portions of it, have not been cut for timber. Now other portions they're homesteads and old whiskey moonshine stills and so on. A very rich cultural history as well, going back to the Native American culture that lived there, of course. REHMAll right. Let's open the phones. There are people who have their own comments for you. First to Fort Wayne, Ind. Good morning, Chad, you're on the air. CHADGood morning, Diane. How are you? CHADVery good. Now I wanted to compliment this gentleman on this obvious passion that he has when he's talking about this. I was born and raised a farmer and just to hear someone who not only takes what he see and hears but what he feels, that's something that's so important in agriculture. And just to hear someone echo that is just -- it's very refreshing and I really appreciate you doing this segment. HASKELL...the plants and animals that they live with, it's really enriching. My wife and I have a small little farm and so I can appreciate that we grow quite a bit of our own food and so forth. REHMOh, I see. Chad, thanks for calling. What did you learn about bees? HASKELLAbout bees. Yes. Well, in the springtime the forest explodes. As the weather warms up and the leaves have not quite come out on the tree in the tree canopy, all these little wildflowers that mostly are about ankle height come seemingly from nowhere just exploding like a starburst of life coming from the soil. Within my one square meter there were probably about 300 of these. And the whole mountainside was covered in a similar density. It wasn't that this particular square meter was particularly special in that regard. HASKELLAnd there are little bees that come out the time and lifecycle to coincide with this emergence of spring wildflowers. And to see that intensity of life after a fairly long winter all exploding out is quite remarkable. Some of these flowers, Spring Beauty is the name of one of the species of wildflowers, has pink pollen. And so you have little black bees going -- flying around dusted with pink pollen. And what they're doing is they're gathering the pollen and the nectar to take back into little nests that they make inside hollow logs or inside the soil to raise their young. HASKELLUnlike honeybees that make it through the winter as a big colony, these native bees generally over winter is solitary future queens, if you like, then start out the year on their own and have to raise their nest from the ground up literally through that one year. So the female bee makes a little nest, raises some young. And in many species those young then become her helpers and her workers and they produce more and more. And it's a very social system. REHMYou said that some of these bees actually become competitive. HASKELLCan you repeat that question? Sorry. HASKELL...organized, controlled system. But really there are a lot of conflicts happening within the hive. And particularly at the early stages. There's some jostling. You know, some of those worker bees would actually like to be reproductive bees. And so there are this chemical suppression from the queen to some of her workers. And the workers have some conflicts of interest about are they going to raise more sisters or brothers and so on. HASKELLSo this notion of a perfectly smoothly running, cooperative world inside animal societies is one that really doesn't hold up. And I think that applies with humans too, right? We're very social and yet we have conflict. REHMAnd you're listening to "The Diane Rehm Show." Let's take another call in San Antonio, Texas. Hi there, Roger. ROGERHello and thank you for taking my call. ROGERThis is a very interesting discussion. ROGERIt's one that is close to my own experience. I remember when I was very young I used to just sit and watch a small patch of ground. It wasn't even a square meter. It might have been 6" square. And I would lay down and I'd look at the plants and the roots and the ants moving among the -- you know, the jungle of the clover stems or whatever it was and the crystal grains of sand. And I always thought if I could know everything there was to know about this one little patch of ground I would know so much about everything else. And it's just interesting to hear someone with the same sort of sensibility. And I certainly appreciate the conversation. Thank you very much. REHMOh good, Roger. I'm glad. You know, it strikes me that children these days have so little time to do exactly as Roger has suggested, just lying there and watching that little patch of ground there. If we could encourage young children to do exactly that they'd probably learn a great deal. HASKELLI absolutely agree, and thank you Roger for your comment. The image of a jungle of little plants there was just a beautiful one. So I absolutely agree. I think all the electronic distractions that we have these days can -- not just for children but can draw all of us out of our sense. So we're more concerned about the apps on our cell phone than the apps that we came preloaded with for free in our own bodies. And those are our senses. Pay attention to our sense of smell. Pay attention to the community of life that's swirling around us in urban areas as well as in the country. HASKELLOne of the encouraging trends I see in education is more and more people seeing what a great opportunity there is to connect children and young adults to the natural world. And I think that conversation was not happening back perhaps many decades ago. And now there are lots of educational reformers, a lot of people working in elementary schools and colleges trying to form that connection. And I think that's encouraging. Probably it's a symptom of the fact that we become disconnected but at least we're realizing this. We're waking up and reestablishing those bonds. HASKELLAnd the great thing is once you get a taste of it, you're hooked. You want to come back for more and it's so life enriching to be connected to the stories of other creatures. It's also humbling because it makes one realize well, there's a lot more in this world than just humans or just my own story. REHMDid you ever feel concerned? You've said that you almost got run over by a deer. Was there ever a moment during that year where you felt some concern for your own safety, other than when you took off your clothes? HASKELLYeah, that was a self-inflicted wound. There were moments but not very many of them. And the moments interestingly came from my subconscious. So one of those, a significant one, I was sitting in the dark and some coyotes started howling very, very close to me. And immediately out of my unconscious comes this thought, you are about to get torn apart by wild dogs. Get out of here. HASKELLAnd then a fraction of a second later my conscious mind comes in, well you know, that's not the case. You know, these are coyotes and here in Tennessee they're pretty heavily persecuted. They're frightened of you. And so there's nothing to be worried about. But that taught me, well my mind has some whispers coming from my ancestors here. There's some wisdom embedded in my nervous system that I need to listen to. REHMDavid Haskell. He's professor of biology at the University of the South. His new book is titled "The Forest Unseen: A Year's Watch in Nature." REHMAnd if you've just joined us, David Haskell is with me. He's professor of biology at the University of the South, at Sewanee. And his new book is titled, "The Forest Unseen: A Year's Watch in Nature." Here's an email from Dan, who says, "I’m puzzled and fascinated by the ability of insects to achieve leverage enabling movement and startlingly long jumps in some species with such thin leg diameters. My understanding of leverage potential is that it requires a certain component's thickness to gain force." Can you talk about that? HASKELLExcellent question. So yes, that's a question about biomechanics. And the first thing I would say is that insects are very light. We humans are very dense creatures, whereas in an insect's body there's actually a fair amount of air. They breathe through little passageways of air that penetrate their body. So volume for volume many of them are lighter weight than humans are. The other thing that many animals do, not just insects, but also frogs, as they jump is that they'll store up energy in their muscles and tendons like a spring. So it's like they're cranking this thing up and then releasing it all at once. HASKELLNow, I'm not an expert on every insect's biomechanics by a very long shot, but that's my understanding of how they achieve some of these rather impressive feats, it's through that storing of potential energy and then releasing it with muscles that are actually quite proportionately large in relation to the weight of their bodies. REHMAnd an email from Kim, in Indiana, "Who is your target audience for the book and was part of your intent in writing the book to excite people about biology and the environment?" HASKELLExcellent question. My target audience would be anyone who wants to dive a little deeper into the stories of the world we're in. So the book is about a square meter in Tennessee, but many of the creatures and the ecological and evolutionary process is that I talk about a universal. I know a number of children have been reading this, maybe 12-year-olds on up. I think the local high school where I live has been using it as a summer reading. So I think it's appropriate for young naturalists. HASKELLThe target audience was not the specialists in my field. I really wanted this to be for people who didn't have a PhD in some small little area of biology. No. Let's take those amazing things from biology and tell those stories in a way that is accessible and compelling and honors the forest, but also honors the musicality of language, and try and tell their story in a compelling way. REHMYou know, we've talked thus far about pretty much what you've seen. What about, um, what you heard while you were in the forest? HASKELLYeah, that's an excellent question. I ask my students this question all the time, what have you heard? Sound is a great way of becoming aware of one's environment. So there's a lot more attention nowadays, not just to the particular individual sounds, but how they unite together into whole soundscapes. And by sitting quietly, what I found happened, was I could sink into that soundscape and the alarm calls and so forth of the animals that had seen me coming died down. So when something happened, like a crow flew over the forest or a deer startled when it came across me, I could hear how these waves of acoustic communication would travel out through the forest. HASKELLAnd I realized that the animals are connected in an acoustic network, a news network. They know what is happening a hundred meters down the mountain slope without seeing it because they're listening. So it's almost like they've got Wi-Fi in the woods except it's a lot better than Wi-Fi because it connects them in multiple modalities, smell and sound. And I found I could tell people were coming down the trail. There was a trail further down slope. I could tell when they were going to be arriving before I saw them because all the chipmunks would start alarm calling. HASKELLLike bow wave of acoustic alarm would precede the arrival of the humans. So listening allowed me to tap in a little bit to the network. REHMAnd what about your sense of smell? HASKELLYeah, the sense of smell is that great connection to the subconscious. So a smell from childhood will snap on a memory and so forth. It's also our connection into the invisible world of the microbes, which is, if you like, the subconscious of the world. We can't see these microbes and yet they are truly the 99 percent that run the ecology of the planet. If you get down near some soil or pick some soil up in your hand and smell it, if it smells healthy, that kind of rich earthy smell, that's the small of actinomycetes, which are little colonial bacteria. They do all sorts of things. HASKELLSome of them are parasites or predators or decomposers. One useful thing that we have managed to learn from them is we've extracted antibiotics. So many of our more success with antibiotics have come from that soil microbial community that can't see, but we can access it, at least in part, through our noses. REHMAll right. Let's go to Baltimore, Md. Good morning, Susan. SUSANHi. You know, it's interesting. I've lived in the city. I grew up in the city and now I live in a rural area. And one of the things I've noticed when I'm out walking in the countryside is that my filters are all sort of reversed or really open to noticing all sorts of things. Whereas, when I'm in the city, you're filtering out so much that you sort of pick and choose, you know, what you're exposed to or what you really take in. But when you're out in the country, you're so much more aware because your filters are all off. HASKELLThat's an excellent point about different environments, particularly environments that we're used to. We tend to have a different sensory approach to them. But I would say even in the country it's helpful to have a practice of reminding oneself to pay attention. Say, okay, well, have I actually paid attention to any smells today? And I know I haven't. I need to do that when I have lunch today. So in the city we are indeed assaulted by many sounds that are not part of our evolutionary heritage, diesel trucks and the amplitude of sound, in particular, is much higher than what is present in many different ecosystems. HASKELLSo it tends to cause us to shut off, but I would say the contemplative approach could also be applied in the city. And in fact, one of my favorite things to do is to sit on a busy sidewalk and just open myself to the soundscape and to stop judging it, like, oh, that's a sound that's making me angry or tense. It's just, wow, listen to that diesel truck. That is the sound of 200 million year old sunlight that got buried and now is being released as we burn that oil. That sunlight is coming out in a great roar. In some ways it's quite a beautiful thing. Now, sometimes we need to filter it off and pay attention to where we're walking so we don't walk into the lamppost. REHMBut of course the other element that has come into sort of get between us and sounds and smells and everything else is the cell phone. And I walk my do every day and he's a little fellow. He does not like it if I have a cell phone in my hand. So I keep it in my pocket and pay full attention to him. And there is a difference in my relationship to him because of that. And my relationship to my surroundings. HASKELLAbsolutely. I think your dog has a very good detector of when your attention is devoted to him or her and then when your attention is directed elsewhere. And I think that the ubiquity of cell phones in some ways is a reflection of the fact that our society has been exploded apart. Right. So even the people we're closest to, we spend most of the day away from them. And our friends and family are all over the place and here's this technology that can reconnect us. HASKELLSo in some way we're going back to the place to seeing campfire of our friends and kin with these cell phones, reconnecting with our close social group. So when I see that blue glow coming on people's faces as they gaze at their cell phone, I'm seeing the glow of a campfire. So from way back -- that's why they're so addictive to us, is because we're highly social creatures. REHMInteresting, interesting. All right. To Cincinnati, Ohio. Hi there, Jonathan. JONATHANHi, Diane. Thanks for having me on. JONATHANNever imagined I'd be calling in for this show, but I had to when I listened to the premise of this professor's book because I went through a period where I sat quietly for years and reflected. And it was in the same place he was. It was at the University of the South, but instead of looking at something narrow and minor I sat at the cross, Professor. And I looked out over the landscape, Sewanee. The University of the South is on the finger of a plateau and has several overlooks where you can see dozens and dozens of acres, hundreds of acres. JONATHANAnd I watched as the sun set every night for a period of about five years, five happiest years of my life at Sewanee. But I'd love to hear your reaction to taking a macro approach to what you did in a micro approach and the ways that they can be similar. HASKELLThat's fabulous. Thank you, Jonathan. It's great to hear from you. And for the listeners who are not familiar with the geography of Sewanee, the cross is a big war memorial cross that overlooks most of the county. There's this beautiful view and when the sun sets it's just fabulous. I would say that what you did was in some ways macro, sort of looking out, but in other ways it really was the same thing. It was returning over and over again to the same place to see how the texture and feel of that place changed day by day. HASKELLAnd so whether we're gazing at little snails in front of us or gazing at the beauty of the sunset, the practice is returning, often when it's inconvenient to us. Right? So having that discipline, saying I'm going to come back and be faithful to this place every day or every week or whatever the practice is and see how that changes me and see how the place can open me up. So I'm delighted to hear that that happened also in Suwannee. I know that there are several students who have done this from other overlooks, who've had a practice of going out every day as the sun sets, just to check in with themselves from the craziness of sort of campus life and sort of that period going from 18 to 21 years old. HASKELLThere's a lot of things swimming in your mind and emotions. And it's a touchstone for them. And that gives me great pleasure to know and great hope, as well, that there are folks who are swimming down just to check in with the world and themselves on a regular basis. REHMI wonder about the new study on carbon emissions that came out this week, saying that global carbon dioxide emissions have increased by 58 percent since 1990. They rose three percent in 2011, 2.6 percent in 2012. You were there for one year. I wonder how what you saw might have been affected by these carbon emissions. HASKELLThat's a great question. And the rising levels of carbon dioxide and other green house gasses like methane is the big question of our times and it will be the question for the next generations to come. And there's a lot that could be said about that one thing. I would say in general, is that forests and the oceans have sucked up a lot of the carbon dioxide that we've released. And so this study for me underscores the importance of protection and good management of forests because half of the carbon that we've burned from fossil fuels has been drawn in by forests and by the oceans. HASKELLSo we'd already be much further along, the--the climate4 change trajectory if it wasn't for those forests. I would also say that any kind of natural observation of nature these days is tinged with a sense of impermanence. And the Tibetan Mandela is impermanent as well. When it's finished it's swept up and thrown into flowing waters. But ecosystems are going to be radically different in 100 years because of climate change. So what I saw is just a snapshot. REHMAnd you're listening to "The Diane Rehm Show." A last question from Steve in St. Louis, Mo. Good morning to you, Steve. STEVEGood morning, Diane. It's a pleasure to talk to you. STEVEAnd I want to first say that your interview with F. Murray Abraham was maybe the best I've ever heard. REHMOh, that's great. Thank you. It was a delight to talk with him. STEVEAnd, David, fascinating. I'm looking forward to ordering the book off Amazon. You're like a modern-day Thoreau. STEVEOne question, in the year you were there did you use any of your students to help you with the research and to tabulate the data? And have you used any of this in your classroom? HASKELLI did not use the students at this one square meter. I take my students out in the woods all the time. In fact, I'm running back to Suwannee tonight, just so I can be on time for class tomorrow. I do a lot of work with my students in the woods. This particular project I wanted to just be stripped down to me, the woods, my senses, what can I make from this. And so in terms of how this impacts the classes though, I would say I do more of this contemplative approach to observing nature than I used to. HASKELLSo I will ask students through a semester, in addition to all the experiments and the statistics and the other things that we're doing as sort of scientists, to choose a little patch of ground and watch it for a semester or to choose a soundscape on a particular part of campus and listen it through many months. And to me these things are not in conflict. Science and contemplative practice can support and inform one another and give us a more complete view of what our relation to the world is and what our understanding of the world is and bring more of that into my classes. REHMHow do you think you've been changed by the year you spent? HASKELLI would say that I'm a lot more aware of how often my senses are actually closed down and that I need to wake up and start listening. The other thing I got was a real deep sense in my bones that we are kin to the rest of the community of life. When I look at a tree, it's my cousin. And that's the great Darwinian insight that I don't think has fully filtered into our cultural consciousness yet, is that we truly belong in this world. REHMDavid George Haskell, his new book is titled, "The Forest Unseen: A Year's Watch in Nature." You inspire me. HASKELLThank you, Diane. It's been a great pleasure and honor to be here. REHMThank you. And thanks for listening all. I’m Diane Rehm.